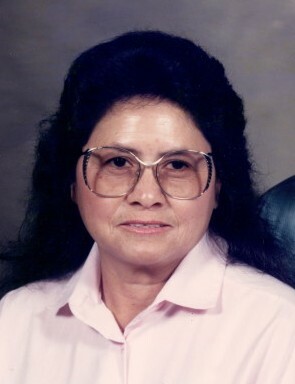 Manuela N. Echavarria was born on September 1st, 1942 in Shafter, TX to Heliodoro and Reyes Navarro. They moved to Giovingo Farms and then to Loving, NM where Manuela met her husband and raised her family. She was employed as a housekeeper for twenty years. She enjoyed playing bingo, going to the casinos, and loved spending time with her grandchildren and great-grandchildren. Manuela was preceded in death by her parents Heliodoro and Reyes Navarro; her brothers: Ramon, Chavel, Carmen, Jesus and Jose Navarro; sisters: Dolores Montes and Maria Mendoza. Manuela is survived by her loving husband, Rafael Echavarria of Loving, NM; her sons: Rafael Jr. of Carlsbad, Reynaldo Echavarria and wife Marie of Carlsbad, Elias Echavarria of Loving; daughters: Melinda Vasquez and husband Harvey of Carlsbad, Lorina E. Rios and husband Juan of Loving; grandchildren: Rafael C. Echavarria and wife Martina, Jonella E. Vasquez, Jennifer C. Echavarria and partner David Soria, Nathaniel R. Echavarria, Joleen E. Vasquez, Lakisha E. Rios-Villa and husband Erick, Emily Echavarria, Daniel Echavarria, Javier E. Vasquez Jr., Juan E. Rios, III, Angelica Rios-Maldonado and husband Rafael, Jonathan R. Echavarria, Griselda E. Rios, Janae C. Echavarria; eight great-grandchildren and numerous nieces and nephews. Surviving sisters: Pabla Martinez, Margarita Parraz, Thomasa Villareal of Carlsbad, Valentina Murillo and husband Nester of Lovington, NM. She was dearly loved and will be greatly missed by all.